I've prepared a 36 page preview in multiple formats. You can right-click on any of these and choose "save as" to download the file to your computer. 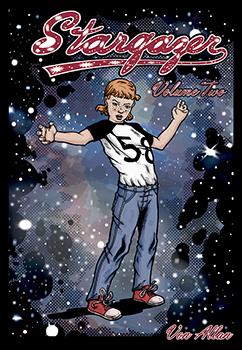 PDF: Right-click here and select "save as" to download Stargazer Volume 2 Sampler in PDF format. You'll need a copy of the free Adobe Acrobat Reader which you can download right here. CBZ: Right-click here and select "save as" to download Stargazer Volume 2 in CBZ format. CBZ is a comic book archive that can be viewed by programs like CDisplay for Windows, Sequential 2 for Macs, Comix for Linux, and Comical (for all three operating systems). PNGs: I've also created a zipped file containing the 36 pages as raw PNG files. Please right-click here and select "save as" to download the zipped file to your computer. Facebook Please click here and then click the Facebook Like button at the top of the page. Or you can just click the Facebook box at the end of this page, too! Alternatively you can share the following link on Facebook: http://stargazer.vonallan.com/2011/07/stargazer-previews.html (please copy and paste link).